This cartoon was originally published in Punch, an illustrated British periodical that took a humorous and satirical look at contemporary life. It was then reproduced in Our Dumb Animals in July 1932. 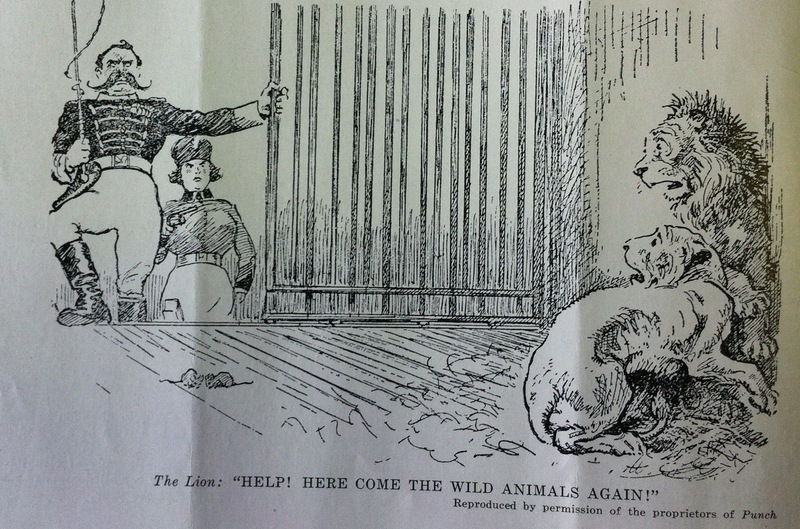 The scene is the lion’s cage at the zoo, and in this cartoon it is the lions, not the humans, who are represented as the ones with the ability to speak: “Help! Here Come the Wild Animals Again!” As the “lion tamers” enter their cage, one brandishing a large whip, the two big cats cling to one another and cower in terror. For some viewers–in particular when this cartoon first was published in Punch, a periodical that was not especially focused on issues of Humane Education, animal welfare, or animal rights–this cartoon may have been read as humorous because of the role reversal element. However, when this image was reprinted on the pages of Our Dumb Animals the plea for compassion for all species becomes foregrounded, and this cartoon can be seen as part of the larger dialogue around the use of animals in entertainment. During this era groups like the Jack London Club worked hard to educate both children and adults about the harsh realities many animals who performed in circuses, zoos, or on film endured, and so this issue was very much a part of Humane Education at this time.